2.0 L I4, CX-3 Touring, SUV, 6-Speed Auto w/OD, AWD. 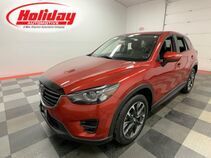 New 2019 Mazda CX-3 - Smooth, sporty, and a whole lot of fun. The 2019 Mazda CX-3 arrives this year with some exterior and interior updates to improve your driving experience. Proudly wearing Mazda’s popular Kodo design, this hatchback brings energy and excitement to your daily commute in Fond du lac or Oshkosh. Under the hood you’ll find a standard 2.0L SKYACTIV®-G engine that provides 148 hp and up to 34 MPG on the highway. Also standard is Mazda’s G-Vectoring Control system along with a retuned suspension and recalibrated power steering and chassis. New this year is a redesigned front grille, taillights, and wheels. The mechanical parking brake has also been replaced with an electronic one, leading to a center console with more storage and functionality. The front seats have been redesigned as well, and full-leather seats are now available on the Grand Touring model. Stay connected with the standard 7” color touch screen, Bluetooth audio, and available navigation. CX-3 also brings you peace of mind with a rearview camera, available Smart City Brake Support, and more. Visit Holiday Mazda in Fond du Lac today to experience Mazda’s first small SUV and see why it may just be the king of subcompact crossovers.